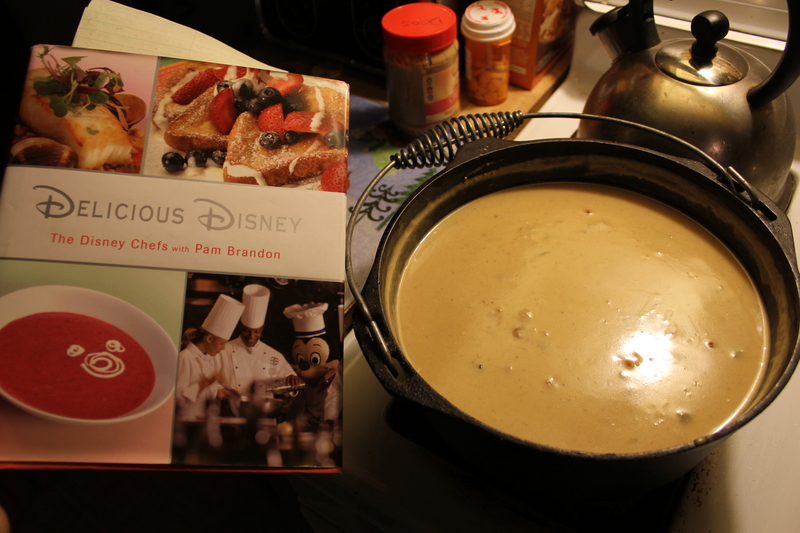 Recently I cooked up a batch of Canadian Cheddar Cheese Soup. My wife and I first had this soup way back on our honeymoon (about 7 and a half years ago, I think). It’s served at Le Cellier at Epcot in the Canada Pavilion. We’ve been to this restaurant twice and are going to return on our upcoming vacation this summer. At the restaurant they serve this soup with their awesome Pretzel breadsticks. Obviously I would recommend this restaurant if you are stopping by the World. It’s a bit pricy as the menu focuses on steaks, but you’re probably on vacation, so spoil yourself! That being said, I have to confess; I have cooked this before. My wife loves this dish and has been pushing for it. So with some arm twisting, I made it again, but I want to point out to her that I thought the point of this blog was for us to eat NEW things. It’s a delicious recipe, it’s bacon-y(not a real word, but my blog)cheesy, creamy, with a little bit of a zing. The problem is, the first time I made it, it was a little thick so I decided to tinker slightly. I decided to up the amount of chicken stock in this recipe. Lucky for me it worked. Catherine didn’t notice! The recipe was not that difficult to cook even though it seems like it could be intimidating. This is a dairy based soup and there is one rule you need to follow to make a soup like this work. Milk does not like to boil for long; it can simmer, but not boil. If you ever let milk begin to boil for more than a few seconds by accident, you know what I am talking about. If you’ve never done it before, try it, I dare you. If you would rather not try it; here is what will happen. It hurts the flavor, burns easily, not fun to clean and it could cause the whole mixture to separate and curdle on you. Since you spent all this time working on a great soup, I wouldn’t want to risk it. Tempt fate and you may get lucky, but why deal with luck when you can control the situation. Once we successfully navigated through simmering the milky liquid and slowly and carefully added all the yummy cheddar cheese, we had a wonderful silky soup. 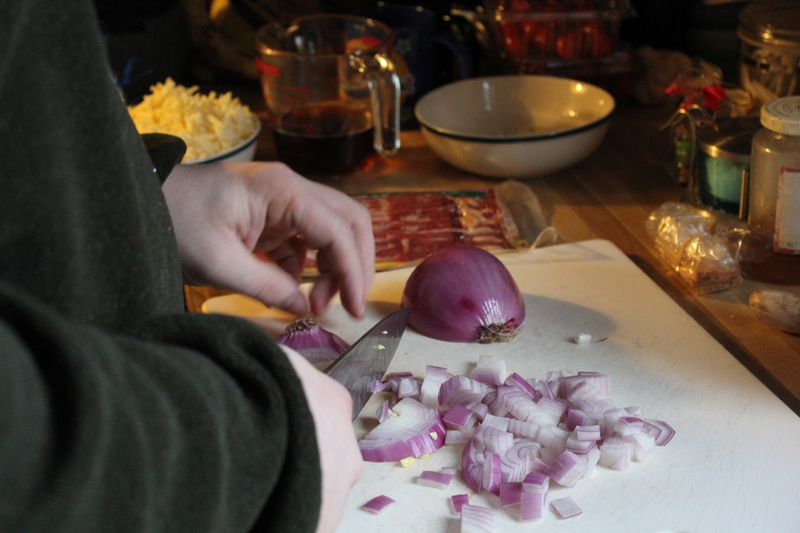 We decided to present the Soup to my harshest critics, our kids. 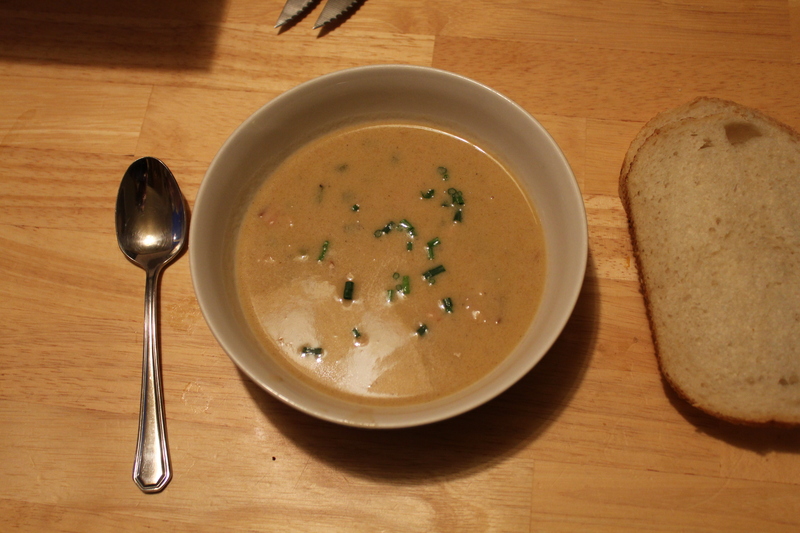 The soup received reviews such as Mmmm, it’s Yummy, and “More Soup?” I call that a success. That’s not the end of this story though; the recipe in my book makes 10 servings. With my additions we got about 12 out of it. Since we are trying to eat better, we decided eating the whole pot ourselves was probably not a good idea (not surprisingly my wife was not enthusiastic to give away her hard-won soup, but decided to share, eventually). So we decided to invite our friends Katie and Erich over for some soup. I was asked if Pretzel Breadsticks would also be served, but this is not a restaurant (Pretzel Breadsticks would have been delicious though, but I’ll save that for a different post). I did decide to mix it up a little though. I carefully heated up some of the soup and poached some shrimp in one batch and boiled some potatoes and added them to a second batch. 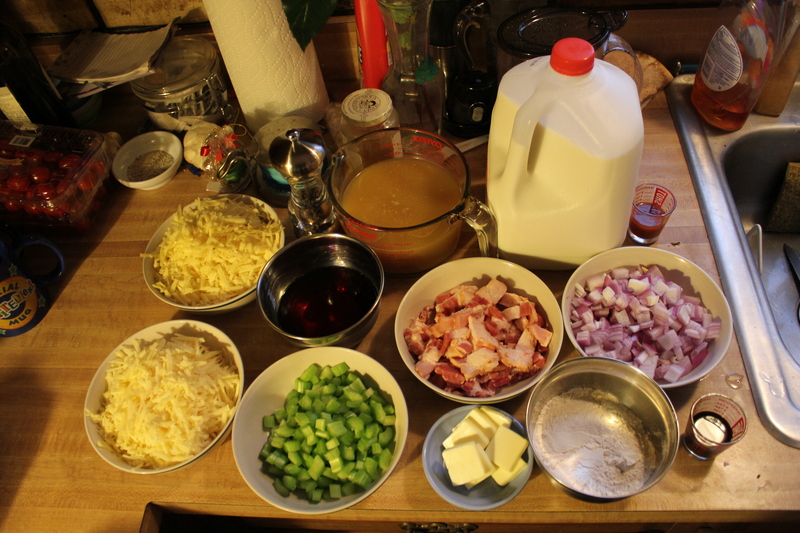 Without the additions, the soup made a better appetizer, but with the additions, it transformed the soup into a good entrée. Feel free to play around with it! If you do, let me know what you did. You can never have too many ideas.